The canning of pilchards for leading southern African brands has been the mainstay of Etosha Fishing's business over the years. 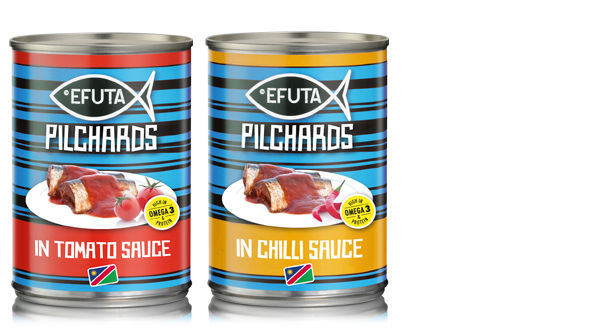 In 2018 we also started canning pilchards under our own EFUTA Pilchards brand. The product is available in two flavours namely tomato and chilli sauce. Exceptionally low in cost, high in protein and especially rich in Omega 3 fatty acids, EFUTA Pilchards is the most affordable, nutritious meal money can buy. Its robust packaging and long shelf life makes it an ideal product for even the most inaccessible and remote markets in Africa. EFUTA Pilchards is canned under the highest health and safety standards. The product is Halaal Certified and complies with National Regulator for Compulsory Specifications (NRCS) and Namibian Standards Institution (NSI) regulations and standards. Interested in distributing this product? Contact our sales department.